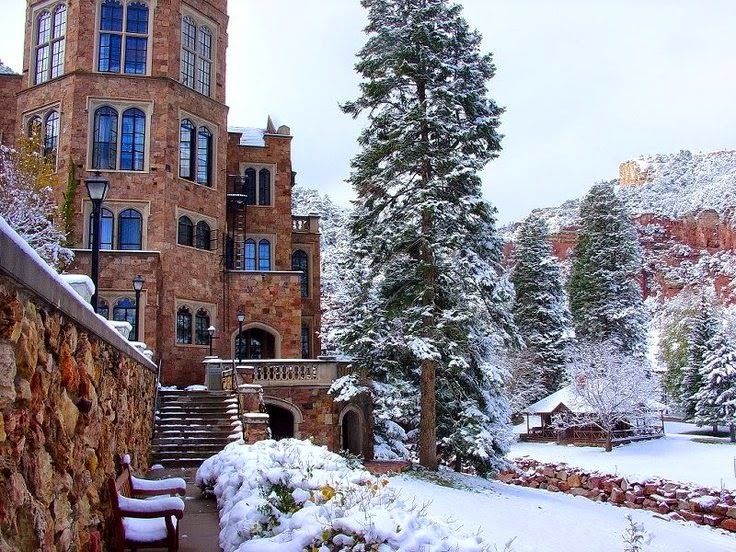 Heroes, Heroines, and History: Glen Eyrie: the Castle in Colorado Springs + Book Giveaway! Glen Eyrie: the Castle in Colorado Springs + Book Giveaway! When I first moved to Colorado Springs, my excitement grew at the thought of finally having the opportunity to do on-site research and start planning for books set in historical Colorado. The state itself has always fascinated me. Imagine my surprise, though, when I encountered a man named General William Jackson Palmer (founder of Colorado Springs and owner of the Denver-Rio Grande Railroad) who is famous here in Colorado but was actually born in Delaware -- the same state where I lived for nearly 30 years! Looks like I'm not the only one to move from Delaware and find a home in Colorado. :) Not only did General Palmer find a home here in Colorado, but he built a CASTLE! That's right. The saying goes, "a man's home is his castle," and Palmer took that literally. 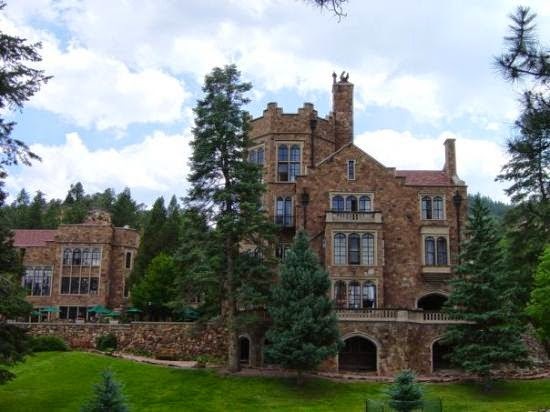 Glen Eyrie is an English Tudor-style castle. 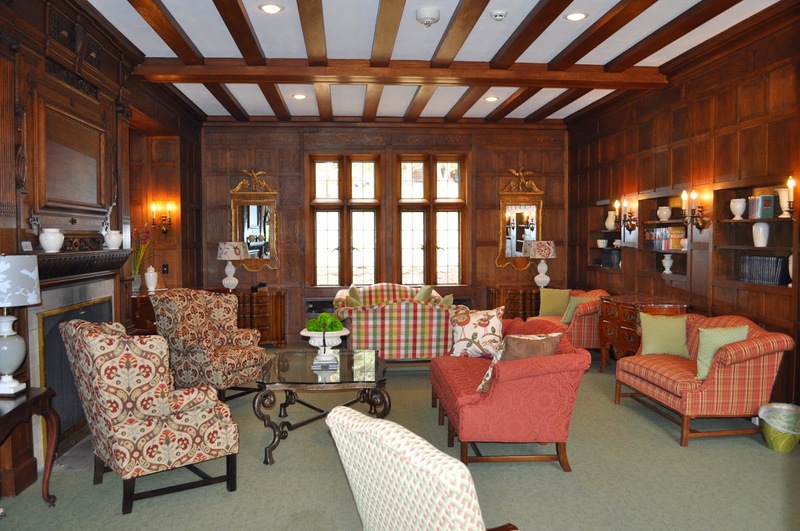 There are 17 guest rooms in the castle, as well as 4 meeting rooms and 2 dining rooms. This house was his dream home and is near Colorado Springs in the northwest foothills north of the Garden of the Gods rock formations. After building a large carriage house, where the family lived for a time, Palmer and his wife Mary (Queen) Mellen built a 22-room frame house on the 800-acre estate. This house was remodeled in 1881 to include a tower and additional rooms, and made to resemble a stone castle, reminiscent of those native to England. In 1880, Mrs. Palmer suffered a mild heart attack and was advised to move to a lower altitude. She and the girls moved to the East Coast and then to England where General Palmer visited them as often as he could. Queen died on December 28, 1894, at the age of 44. In sorrow, General Palmer went to England to return Mrs. Palmer's remains and the girls to Colorado Springs. The Palmers had three daughters: Elsie, Dorothy, and Marjory. The castle was advanced for its time, featuring a primitive intercom system, and a chimney system that would hold the smoke until the wind was blowing in the right direction to take the smoke out of the valley. Glen Eyrie is on the National Register of Historic Places. The castle is now owned by The Navigators. The general public is allowed on its grounds Monday through Thursday to visit its bookstore, located at the Carriage House. Tours of Glen Eyrie Castle are available to the public and require an advance reservation. Events hosted at the castle include English and Victorian teas throughout the week and Christmas Madrigal Banquets beginning after Thanksgiving. Glen Eyrie is also a conference and retreat center that hosts many conferences and programs. 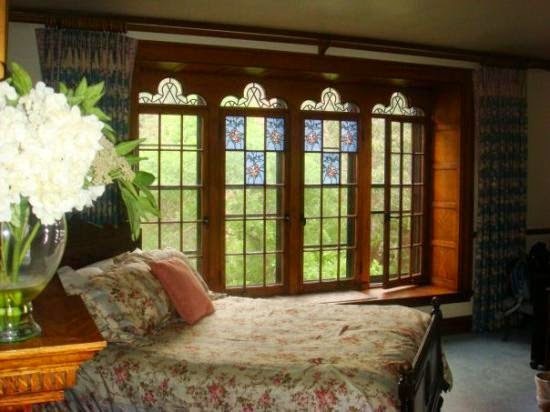 The property in the enclosed valley is also available for use by groups for meetings, receptions, and retreats. Herds of bighorn sheep, deer and wild turkey may often be found grazing on the grounds. Have you ever visited a castle of any kind, anywhere in the world? Where was it? What does *your* dream home look like? What amenities are a must-have? Leave a comment below answering either one of the 2 questions or talking about the new release featured here for your chance at a FREE autographed copy of Brandywine Brides. Winner will be chosen on February 11th. 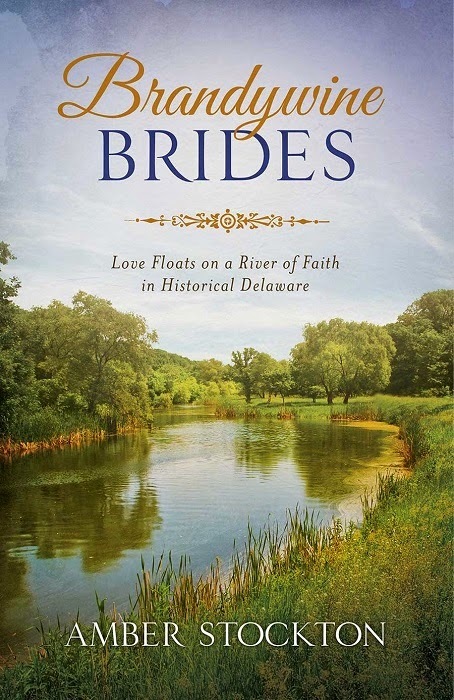 February marks the release of my 15th title, Brandywine Brides. This is a 3-book compilation of my series set in historic Delaware during the Gilded Age. The stories connect the family from my very first series to the family featured in this one. Nestled amid the beauty of historical Delaware, three generations of bookstore owners find love grows out of a shared love for great literature. Charlotte Pringle is pressured by her parents to marry advantageously, but while Richard Baxton loves her, he cannot provide for her because all his finances go to help his niece walk again. Grace Baxton is on the search for a missing heirloom book. Andrew Bradenton offers to help her, but his past mistakes cast him in a suspicious light, even while a dashing suitor catches Grace’s eye. After the loss of his friend and her brother on the Titanic, Aaron Stone encourages Lillian Bradenton to restore her hope by bringing a boarded-up bookstore back to life. Will each woman’s literature-inspired dreams lead her to the right man of faith and devotion? Tiffany Amber Stockton has been crafting and embellishing stories since childhood, when she was accused of having a very active imagination and cited with talking entirely too much. Today, she has honed those childhood skills to become an award-winning author and speaker who has partnered with Nerium International in the anti-aging skin care industry, helping others look younger and live better. She lives with her husband and fellow author, Stuart Vaughn Stockton, in Colorado. They have one girl and one boy, a Retriever mix named Roxie and and Australian cattle dog named Timber. 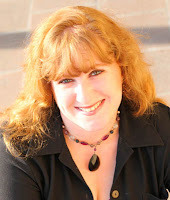 She has sold seventeen (17) books so far and is represented by agent Sandra Bishop of the TransAtlantic Agency. You can also find her on Facebook, Twitter, and Pinterest. I would love to visit a castle, but alas. My dream home would be an eco house. Build from recycled materials & as self sustaining as possible. Having said that it needs to come with a housekeeper/cook thank you. Fun post, Tiff. I wonder how many American Castles there are. We live near the Biltmore in Ashville, NC. Beautiful place. I did a post last year on that castle. My husband took me to Italy on our 20th Anniversary and because I am fascinated with Castles we spent 3 days and 2 nights at the 12th century Castello Del Oscano in Perugia, Italy. Talk about loving those 3 days! I have not had the opportunity to visit any castles, although I would love to. I am particularly drawn to the ones in Ireland, possibly because my heritage is Irish! I liked reading about this castle in Colorado. Thanks for the giveaway! Loraine, I would love to get to Scotland and England for those castles because my ancestry is there, so I understand the draw and appeal in that area. Thanks for sharing that post, Janet. What an experience you had! So fun to put your foot in George Washington's bath. :) I've driven through that area and seen that castle but never stopped. We were always on our way down to Massanutten in Virginia via western Maryland. I love castles. Unfortunately, I have never been able to visit one in person. I long to go to Scotland and tour many of the castles there. Ginger, you're not alone. 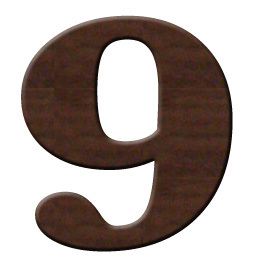 You should see my list of must-haves for our next home. We've been in this one for almost 4 years, and while it's been great for us, I definitely "settled" on a few amenities or features I'll make certain to include in our next home. Praise the Lord, it looks like it will happen in about 2 years. I can handle that! 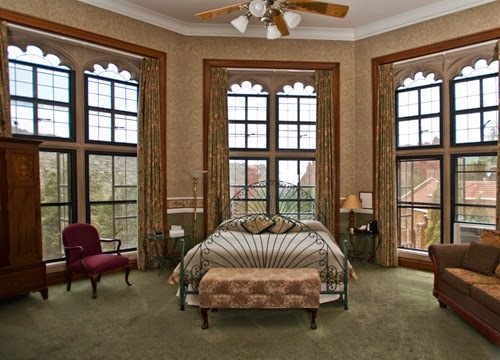 A friend and I went to a Christian writers' conference held at Glen Eyrie and stayed in the turret room pictured above. It's an awesome place--and the only castle I've visited. My dream home would be in the country, but not too far from town, with a small lake nearby and no other houses visible. Yes, Vickie, it's the annual conference hosted by Angie Hunt and often including several other well-known fiction authors on staff to work with attendees and provide amazing one-on-one attention. Double bonus to be held at a castle! Oh, Tiff, I love castles. We didn't see the insides of the ones along the Rhine when we went to Germany, but observed them from the boat as we sailed the river. Beautiful. We did visit two and my favorite was Neuschwanstein Castle where we toured the castle and stopped to sing one of our songs in a room like a music chamber. Awesome sound. It is the basis for the design of the castle at Disney World and it was like a fairyland. Also took a tour of King Ludwig's castle. One of these days I hope to visit Glen Eyrie. Love your books, Tiff, and so glad you have this compilation out now. I've been to Glen Eyrie a few times. We went there for the Bible History exhibit a couple years ago. AMAZING place. There's another castle down south of Pueblo that my parents visited this summer. It's Bishop Castle. The builder is still alive. My pleasure, Deanna. Hope you DO make it back here to see the castle. It's an experience you won't forget. I've been to Craigdarroch Castle in Victoria, BC Canada. I have also visited the Biltmore House in Asheville, NC which would be considered an American castle! I have never visited a castle, but it is on my bucket list and I shall do it before I die! I stayed in Ashford Castle in Ireland. This historic castle has been turned into a luxury hotel. It was fantastic even though we stayed there in March and the weather wasn't very cooperative! I have visited England on more than one occasion. I once got to see Hampton Court. My imagination ran wild. This was where Henry VIII lived with Ann Boleyn. I loved playing out a Jean Plaidy novel in my mind. The gardens are exquisite. We also went to theTower of London. There is a plaque outside showing the sight where they chopped off the heads of anyone that didn't appear to agree with Henry. I highly recommend both places. Eww, a place to show the beheading location? At least it's a part of history, and not something still practiced today. Exquisite gardens sound amazing, though, and The Tower of London certainly has a history all its own. Loved this post! I am a huge castle fanatic. I have visited one in Canada - and sadly I cannot even remember the name of it! But I loved every minute of it and the beautiful grounds and gardens. There was a home built about an hour from me that resembles a small castle. It looks abandoned, though, and I don't know if anyone has ever lived in it! Susan, was the castle in British Columbia, or closer to Maine where you used to live? Was so excited to see this post, because Glen Eyre has been a favorite stop for us for years. We were stationed in Colorado Springs while in the military and became acquainted with it. Then when we pastored in Red River, NM, we were only about 3 hours away. We stayed in the castle many times for a getaway, on retreats and went to the Christmas Madrigal several years. It is such a fun and beautiful place. 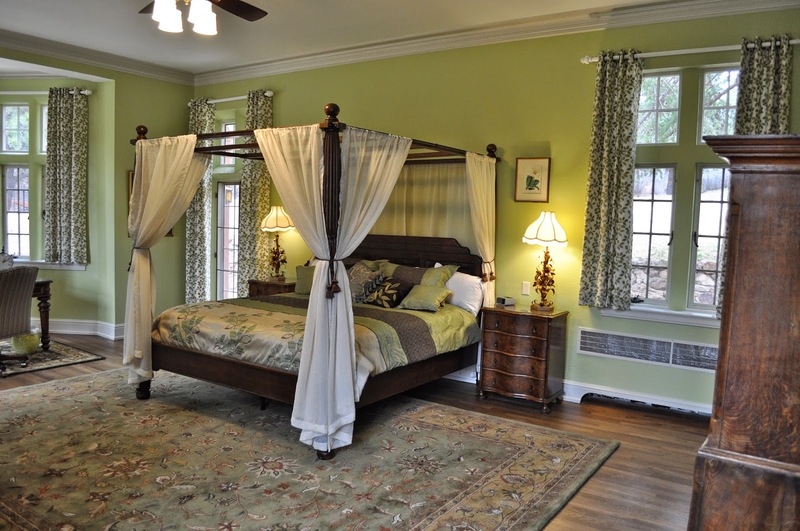 One interesting item is the fact that General Palmer installed a vacuum system in the walls for the servants to clean the vast runs of rugs in the hallways. Our youngest daughter and I took a trip to the British Isles a few years ago and the focus of our visit was to go to as many castle as we could. We went to Windsor Castle, Leeds, Tower of London, Caernarvon, Blarney, Edinborough castles and others I've forgotten at this point. It was so much fun! Thanks for the post! I hope I get to visit Glen Eyre again one of these days. Oh! The Christmas Madrigal. My husband's work had their annual Christmas party there the first year we were married. I adored the entire experience, and the food was delicious! I believe I read about that vacuum system somewhere, but I didn't know the specifics. Thanks for adding that tidbit. And castles in the British Isles...what fun! We were at Garden of the Gods in August and I forgot to visit Glen Eyrie! What a lovely place. Our dream home would be on the coast overlooking the Pacific Ocean with expansive windows for views. Ahh, an ocean gal more than a mountain gal. :) I wouldn't mind a beach house with a view, but I wouldn't want to live there all the time. This gal is mountains all the way! This sounds like a very interesting place to visit; I'd love to go there some day. Alas, traveling from NY state to Colorado is quite a trip. There are (at least) two castles located in the Thousand Islands between NY and Canada, about an hour from my house. I have been to both of them multiple times--Singer Castle and Boldt Castle. They are both amazing structures with fascinating histories. Singer Castle was owned by Frederick Bourne, a self-made millionaire and employee of the Singer Sewing Machine Co. (hence the castle's name) and was designed after Sir Walter Scott’s novel about Woodstock Castle (1832) in Scotland. Boldt Castle was partially built by George C. Boldt, millionaire proprietor of the Waldorf Astoria Hotel, for his beloved wife. Unfortunately she died three years into the construction of the home, and Boldt ended all work on the castle. The Thousand Islands Bridge Authority has been working on finishing/repairing the property's buildings. It's interesting to re-visit and see what new improvements they have made. In a month my mom, sister and I will be traveling to Ireland where we will visit some castles and ruins. I can't wait! The architecture and opulence astounds me.